MSIG operations in Thailand were the proud recipients of the “Consumer Protection - Thailand Call Center Award 2015”, organised for the second year by the Office of the Consumer Protection Board in cooperation with the Management System Certification Institute (Thailand). 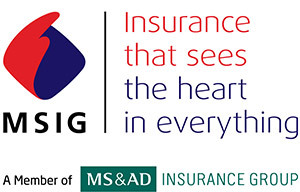 Six general insurance companies from a total of 44 received the award this year, including both MSIG Thailand and Mitsui Sumitomo Insurance Thailand Branch. The award is made in recognition of excellence in the provision of call centre and consumer services after an evaluation by the Office of the Consumer Protection Board of MSIG’s operations using the Board’s standard criteria which look at the company’s handling of customer problems and improvement of customer experience, HR management practices to support customers, staff engagement, and finally process and infrastructure support. M.L. Panadda Diskul, Minister Attached to the Prime Minister’s Office and Chairman of the Consumer Protection Board presided over the ceremony held at the Chao Phya Park Hotel Bangkok on 22ndOctober 2015.